Despite his current injury, Jaren Jackson Jr. is having a very good rookie campaign. However, his reputation and his stats don't always align in the ways you might expect. Either the NBA is turning into a freakish league that we don't understand or this year's rookie class is going to be an all-timer. Each of the top five picks - DeAndre Ayton, Marvin Bagley III, Luka Doncic, Jaren Jackson, Jr., and Trae Young - are having seasons that could have won them Rookie of the Year honors at some point in the past decade. Of course, only one - Luka - is going to win it this season. But while he won't get the press coverage of Doncic, Young, or Ayton, don't sleep on Jaren Jackson, Jr.
Jaren, which is what he supposedly goes by and is simpler than "JJJ" or "J-Jack Jr." or whatever other nicknames are out there, is having a strong season. How strong? We are now past the All-Star break and Jaren is averaging 13.8 points, 4.7 rebounds, and 1.4 blocks per game, and is shooting 36% on three-pointers. Since 1980, only three other rookies have matched those numbers: Raef LaFrentz, Joel Embiid, and Kristaps Porzingis. That's good company. So let me explain why I'm not more impressed. The Walking Contradiction, Jaren Jackson Jr.
With the raw numbers you see above, it's clear that Jaren can play. However, there is something strange about his game. The only way to describe it is that his game is somehow self-contradictory. Take his shooting, for example. There have been six 6'11 rookies to ever shoot 2.4 three-pointers per game (as Jaren is doing this season) and make over 35% of them: Jaren, Lauri Markkanen, Andrea Bargnani, Joel Embiid, Luke Kornet, and Raef LaFrentz. Among those players, Jaren Jackson Jr. is shooting far better overall than the others. He has a much higher overall FG%, a higher EFG%, and TS%, and is shooting much better on 2PAs. So he's a good shooter - how is that contradictory to anything? Because Jaren can't make a corner-three to save his life. Three of the best references for NBA stats have slight disagreements on his actual percentages, but the conclusion is the same. Basketball-Reference.com has him at 16.7% on corner-threes. Cleaning the Glass has him at 23% on corner-threes. 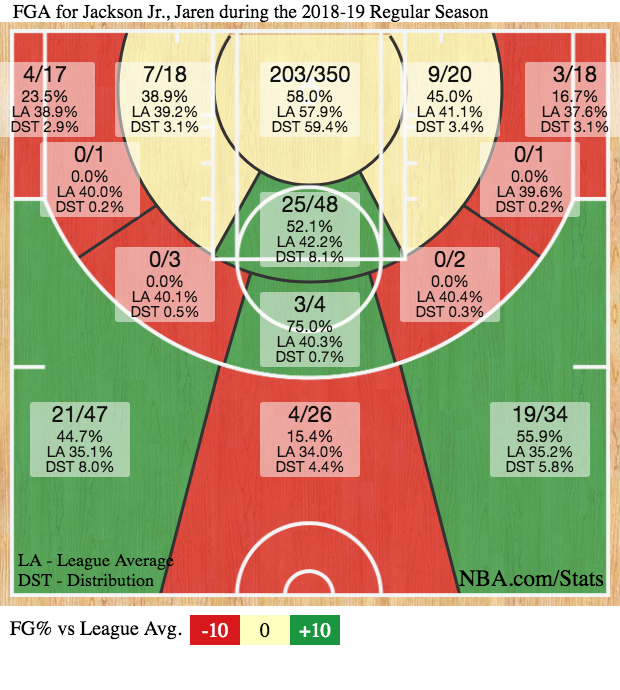 NBA.com has him at 20%, and you can see that version of his shot chart below.? You'd be hard-pressed to make perfect sense of this shot-chart, as it suggests that something is an anomaly. Jaren shot nearly 40% on three-pointers in his only season at Michigan State, so one would think the higher percentages are not complete flukes. So then why isn't he shooting better on the shorter corner-threes? The difference may be that defenders can get closer to Jaren when he's in the corners. In the clip below, simple ball movement on a smartly designed possession leads to a wide open Jaren Jackson Jr. three-pointer. He's shooting just over 38% on wide open threes, taking 1.8 per game. However, when that defender inches closer to Jaren, the shots stop coming. He is taking 0.6 three-pointers per game when the nearest defender is 4-6 feet away (making just 25% of these) and has only taken three total three-pointers this season when the nearest defender is inside of four feet. Where the court shrinks (the corner), Jaren's space is limited, so it seems he'd rather not risk the shot. This should change as his career progresses. Jaren has crazy athleticism, as can be seen virtually anytime he starts moving, but he's going to need some time to get more confident in what is a pretty effective (albeit rough-looking) shot. However, there's more. Synergy Sports ranks Jaren Jackson Jr. in the 72nd percentile among all players in points per possession (PPP) offensively. That means anytime a possession ends with the ball in Jaren's hands, the Grizzlies have an expected outcome of 1.027 points. For comparison, that's a better number than guys like Joel Embiid, Kemba Walker, CJ McCollum, and "Gunner God" Lou Williams. Jaren is excellent in transition, he scores well on put-backs, and he's slightly above average as a spot-up shooter or a post-up scorer. But according to Cleaning the Glass, the Grizzlies are 3.7 points worse per 100 possessions on offense when Jaren plays. The explanation likely involves countless other factors, but one of the more interesting ones is the sneaky-bad offensive season Mike Conley is having. As a veteran point guard, any coach would gladly pair a young big (Jaren) with Conley. But it doesn't seem to be working. When Mike Conley and Jaren Jackson Jr. play together, the Grizzlies are in the 15th percentile among all two-man combinations in the league in Offensive Rating. Couple this with the fact that Jaren has a relatively small number of plays as the roll man in the pick and roll (normally a highly productive play which hasn't been very effective for Jaren - he ranks in the 38th percentile, per Synergy) and you start to see where the struggles are coming from. The clip below shows a common theme when browsing Jaren's highlights. He gets momentum toward the rim and finds himself in a position to put up a left-handed floater. It's not quite a fluid layup, it's not quite a push shot, and it's not quite a teardrop. It's awkward, and this example gets blocked by Marcin Gortat. There are many examples of this shot-type at the end of a pick and roll or just a straight 1-on-1 drive. A decent amount of them go in, but the awkwardness of the shot makes you wonder if it's defying the odds. The good news is that Jackson won't turn 20-years-old until next preseason. He and Mike Conley - or he and anyone else, for that matter - have time to work these things out. The Grizzlies are playing low-stress basketball for the time being and that should help a player like Jaren solve any of his issues. Wrong. There is a glaring set of contradictions in Jaren's defense. Going into the draft, it was pretty well agreed-upon that he would be a strong defender. Presently he ranks 16th in the NBA in blocks per game and 2nd among rookies, trailing only Mitchell Robinson, AKA Mitchtumbo. Per Cleaning the Glass, the Memphis Grizzlies allow five fewer points per 100 possessions when Jaren's out there vs. when he's resting. Furthermore, Memphis is a good defensive team to begin with. They have a team Defensive Rating of 106.5, good for 6th in the league (per NBA.com), and that drops to a ridiculous 102.4 when Jackson is on the floor. For everything that was bad on offense when Mike Conley and Jaren Jackson Jr. were on the floor together, the opposite is true on defense. The Grizzlies allow just 101.5 points per 100 possessions when these two share the court, and their best lineup (which is now impossible due to the Marc Gasol trade) allowed a DRtg of 95.3 in over 900 minutes. These guys can defend. Guys score on Jaren. Easily, too. He ranks in the 33rd percentile in the NBA in points allowed per possession, which puts him in a worse spot than defensive stalwarts like Kyle Korver, Jabari Parker, and Mario Hezonja. He ranks in the 32nd percentile in the league as a big defender in the pick and roll - worse than international fugitive Enes Kanter and international not-very-good basketball player Alex Len. Simply put, Jaren has seemed a half-step late or a bit flat-footed on an awful lot of possessions. For example, Dario Saric should not be easily beating Jaren off the dribble, as we see in the clip below. The only "move" Saric makes is a small hesitation as if he's considering a dribble handoff. He then gets to the rim, draws a help-defender, and finds the open man in the corner. The shot misses, but this was bad defense at the point of attack. As another example, here is E'Twaun Moore giving Jaren half a move and getting into the restricted area, where he's finally met with some resistance. There are more example of this than you might expect to find from a guy who blocks a lot of shots and holds a top-tier DRtg. Jaren Jackson Jr. is going to be an excellent player. He's already a lock for the All-Rookie team and is a starter on one of the league's best defenses. His offense is very good on paper, and while it doesn't always pass the eye test (his shooting form is somewhere between Shawn Marion, Reggie Miller, and Kevin Martin), the shots are generally falling. As his jumper comes around, there's no reason Jaren couldn't turn into a Diet Kevin Love offensively while making All-NBA Defense teams. For all of the confusing things mentioned above, he's already awfully good. When you consider that he's the same age as the oldest kid in a high school graduating class, the whole thing becomes more impressive. And for all the slip-ups I mentioned on defense, here is a 7:45 video of him blocking shots... and it only includes the first three months of the season. For every time he's half a step slow, there's a time that he's instinctively inching into help-position and blocking a shot. The next step for Jaren is simply getting healthy. After that, the future is blindingly bright. Receive email alerts when we add new content to the website about the Memphis Grizzlies. Memphis Grizzlies: Return of the Grit 'n' Grind? Or an evolution into something more? Who Should the Memphis Grizzlies Draft with the Fourth Pick?